MODERN. STYLISH. VOGUE. No detail has been overlooked in this completely renovated 2 bed, 2 bath gem at The Vogue in the heart of Lower Lonsdale! Step inside this bright corner unit and you'll be greeted by the spacious open concept kitchen, living, and dining area which features quartz countertops, high end stainless steel appliances, and a gorgeous fireplace wall with contemporary hexagon and marble accents. You'll also find brushed oak engineered flooring and brand new blinds, lighting, and doors throughout. The spacious patio on the quiet side of the building is perfect for BBQing and relaxing. 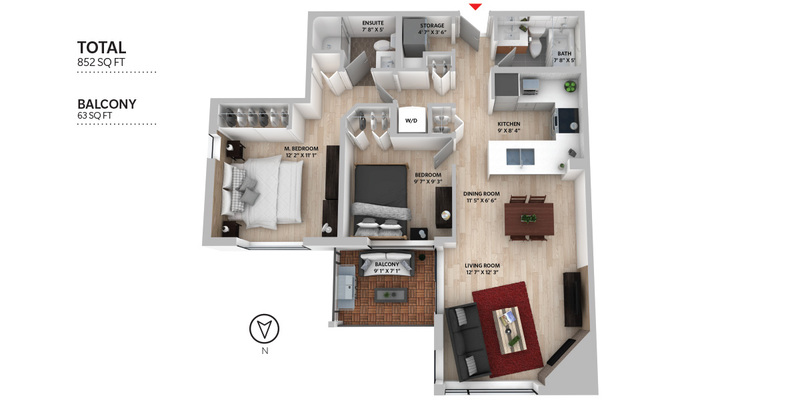 With 2 bedrooms and an office sized flex space, there's plenty of flexibility to make this space your own. Storage, parking, insuite laundry, and pets and rentals allowed (with restrictions) makes this a no-brainer!